Team Sanya, skippered by New Zealand Mike Sanderson, sailed a terrific race in the Auckland In-Port Race to clinch fourth ahead of Abu Dhabi Ocean Racing and Team Telefónica, who between them had won all four of the previous races in the in-port series. 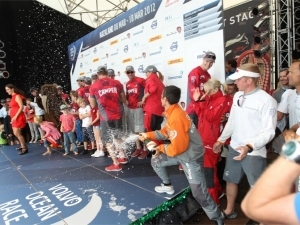 Team New Zealand boat Camper coasted to a dream win in front of tens of thousands of fans to reinvigorate their Volvo Ocean Race campaign. Camper, the Spanish sponsored team who count Auckland as one of their two homeports, earned the advantage with a tack right to the shoreline off the start and once in front never let go, keeping a comfortable lead all the way home on the hour-long course around the Waitemata Harbour. Puma Ocean Racing of the USA finished second, just 54 seconds behind, followed by the Groupama sailing team of France third. "The one thing we said all week was how do we thank everyone who has supported us," skipper Chris Nicholson told the Volvo Ocean Race website.. "I hope this goes a long way to thanking them. Camper scored six points for the win but it wasn’t enough to edge them ahead on the overall leaderboard where they remain third with 104 points, behind Telefónica (122 points) and Groupama (107). After the 18-minute, 2.5 nautical mile upwind sprint to the first mark Camper had a slight 19-second lead over Groupama. Puma trailed in third by 55 seconds, followed by Sanya 1:29 behind, Abu Dhabi in fifth by 1:35 and Telefónica in sixth by 1:41. The easterly breeze picked up to 18-20 knots but that only enhanced Camper’s advantage as they extended their lead to 40 seconds. Positions remained locked-in as the team’s crossed the finish line much to the delight of the big home crowd.